The following publications were published or assisted by the PHA (SA). Some are now out of print but are available from the State Library of South Australia and may be available at local libraries or second-hand bookshops. Playford’s South Australia, edited by professional historians, Bernard O’Neil, Judith Raftery and Kerrie Round, provides a fresh assessment of South Australian history and Sir Thomas Playford’s role in it, particularly as Premier from 1938 to 1965. 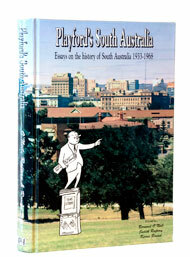 Written by professional historians and geographers, it investigates many aspects of South Australian political, economic and social life during the period when Playford held parliamentary office. The 17 essays focus not only on developments frequently connected with Playford, including immigration, industrialisation, mining and urban and suburban growth, but also on subjects that received less of his attention, such as the arts, entertainment and preservation of heritage. There are also personal accounts of life in the Playford period with which many South Australians will readily identify, and an analysis of the infamous ‘gerrymander’ which kept Playford’s opponents out of office – or did it? Biographical sketches of prominent South Australians such as Dame Roma Mitchell, Professor John Bishop and Dr Helen Mayo, and descriptions of cultural icons such as the Children’s Hour, the Argonauts’ Club, and the Test cricket, illuminate the content and argument of the chapters. 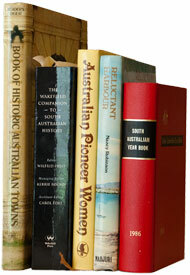 Playford’s South Australia is at once scholarly, lively and accessible to the general reader. This hard-covered book of 408 pages, includes more than 130 illustrations (photographs, tables and graphs), a comprehensive bibliography and index, and chronologies of the Playford period. Using the lifetime service of William Shakespeare as an official with the City Council as a framework, this collection of essays by members of the Association explores a variety of aspects of the life of the city of Adelaide in the period 1860-1930. Themes covered include the city’s churches, homes, schools, pubs, parklands, stores and more. There are essays on the Botanic Garden, the abattoirs at Gepps Cross (established by the City Council), the fish market and the grant of the title ‘Lord’ Mayor. The collection, though now out of print, is available in libraries. It is a vivid evocation of past times in the city of Adelaide. The Members’ Work Database is a catalogue of work produced by historians who are members of the various State and Territory Professional Historians Associations. was published in November 2016 (C. Garnaut, J. Collins and B. Jolly eds). The PHA (SA) assisted the book's publication which contains several members' research contributions.